In today's world – despite the dramatic anthropogenic environmental changes – a proper understanding of the relationship between humanity and nature requires a certain detachment. The pressing problems in their whole extent will only be fully understood and solved with comprehensive and patient analysis. Accordingly, this book develops new perspectives on fundamental questions of biology, ecology, and the economy, integrated within a framework of a terminology specially devised by the authors. By illuminating the epistemological backgrounds of ecological-economic research, the authors lay foundations for interdisciplinary environmental research and offer guidelines for practical action. In close contact to the findings of present-day biology and economics, they demonstrate the fruitfulness as well as the shortcomings of modern science for the understanding of the proper place of humankind in nature. Many of the book's central concepts are rooted in a tradition whose origins go back to European philosophy and literature of the 17th Century. Frequently current problems in the fields of economics, ecology, politics, philosophy and biology are discussed in a kind of "dialogue" with thinkers and poets like Bacon, Quesnay, Kant, Goethe and Novalis. This approach of the book, known in Continental European Philosophy as hermeneutics, offers a ‘map’, rather than marking out a specific course. On the other hand, the book offers traits of the Anglo-Saxon tradition of thought: a precise, analytical approach to theory and a pragmatic approach to action. Both approaches are used by the authors complementarily. Thus the authors lay the foundations for an ecological economical and political practice which is able to tackle concrete environmental problems on an encompassing and long-term basis. 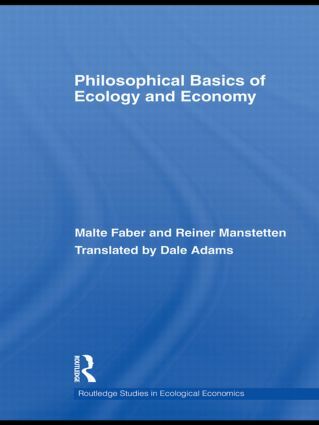 This translated volume will be of great use and interest to students of ecology, economics and in particular environmental education, sustainable development and environmental ethics.